NIFTY View Trading and Investing NIFTY: Over-valued or Under-valued? Nifty is hovering around the 6000 mark. Life time highs are 5% away but still sentiments are very bearish in the investing community and some are even going on to the extent of saying that the market is in a state of a bubble and a 30% correction from current levels is inevitable. Logic being given is that midcaps and small caps are available at fractional rates of their price in 2007. Many blue chips are also down by 50% since then. In this article, we attempt to look at the valuation of the Nifty and compare it with the historical trends. The above chart is the monhtly Nifty chart. 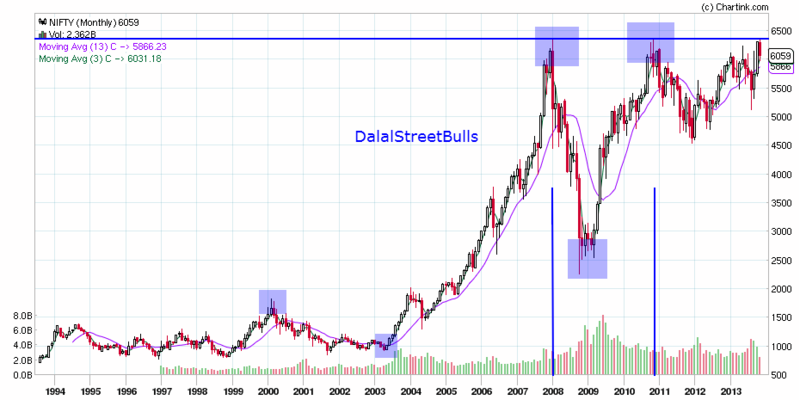 The horizontal line on top shows the triple top it has created since it's peak of early 2008. The 2 vertical lines show the time of the peak respectively. Notice how the historical bull run of 2003-2007 gave 600% returns on the Nifty! Imagine if we were to go through a similar phase now, Nifty would be at 36,000 levels! Before moving on, let's look at another interesting chart. So as per it's historical averages, Nifty looks fairly valued. 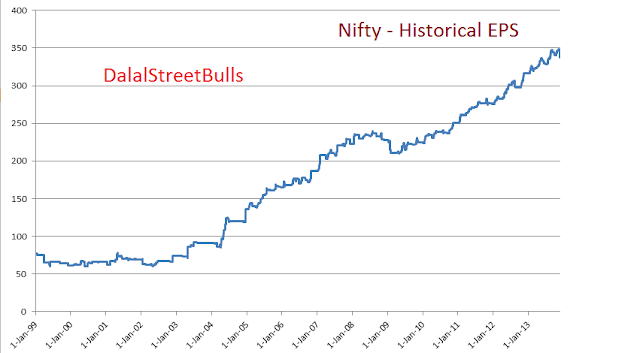 The recent crash in late August '13 saw Nifty at a P/E of 15.2! Usually, the index is between the trading range of 14-22 and any movement beyond these levels means that the market is either under-valued or over-valued. At the time of the dot com bubble burst in 2000 and the 2008 crash, Nifty was at P/E of 28 and largely overvalued which resulted in such a massive correction over the next years. Both times, the valuation went down to levels of 12 and eventually this undervaluation was short lived an the market saw good rallies later. The EPS of the Nifty rose sharply in the 2003-2007 period which supported the great bull run witnessed then (930 to 6350). A healthy bull run is always supported with a growing economy. The EPS of companies back then was growing rapidly as India was experiencing it's finest economic period. The rise beyond the early '07 saw valuations sky rocket and eventually around the 28 mark, the markets collapsed (6350 to 2250). The logic behind this over valued and under valued is that once the market goes above a P/E of 22, it generally indicates highly bullish sentiments. The investors are now discounting out all future growths and their expectation is rising. Reality is left behind and greed is now everywhere and stocks with bad fundamentals also start rocketing. In early 2009 again, the markets were under valued at P/E of around 12-12.5! Fear grips the street when the valuation is so low and strong companies are also available at dirt cheap valuations. The investors are running away from stocks and investing in safe assets. And then a 2 year rally saw Nifty reclaim it's old highs in November 2010 when it hit the 6330 mark, just 20-25 points shy of a new high. But this rally again saw Nifty reach valuations of 26.5-27 which meant it was very overvalued! Now that we are near the highs once again, we stand fairly valued at 17.9 levels and a new high cannot be said over valuation of the markets. As per the current EPS of around Rs. 337, the markets could see levels of 7400 and still be at a P/E of 22. Ofcourse, for sustainable highs and a new bull run the Indian companies have to show growth in earnings and profits consistently. Since the mid '11, markets have been greatly stagnant and have seen rallies in a few sectors such as IT, Pharma and FMCG. The above graph shows the rise in the EPS of Nifty. Notice that in the bull market of 2003-2007, the EPS went up from levels of 70 to 245 ( 250% ) and since then it has risen from 225 to 350 ( 55% in 5 years ). Once this slowdown in growth is done, we shall see the birth of a bigger bull market. This again depends on lowering of inflation as well as interest rates. Now let's look at the Dividend Yield of Nifty and it's relation with the moves. Nifty has always traded in a yield of 1%-2% with breaks in between. Currently, Nifty is trading around a yield of 1.53% and it has an average of 1.47%. The average has always been consistent at 1.4% - 1.6%. Thus, even the Dividend Yield as an indicator shows that the market is fairly valued. The Nifty traded at yields below 1% and these were occasions followed by deep corrections. And whenever the yield went above 2%, a rally followed due to bottom outs. In 2003, just before the rally, Nifty was at a yield greater than 3%. Whenever Yield falls, it means that either the market is rising or the dividend payouts are falling. Whenever Yield rises, it means that the market is falling or the dividend payouts are increasing. P/E, DY are powerful indicators used to see the fundamental valuation of the market and no trades should be taken based on these, only investments should be made by looking at these. When the market hit 6336 levels in November '10 the DY was at 0.99% and the P/E was at 25.55! When the market created it's high in early '08 the DY was at 0.82% and the P/E at 28.29! When the market touched 6340 levels recently, the DY was at 1.46% and the P/E at 18.23! The difference can be seen in the valuations. By no means can we say that the index is over valued. If there is a correction in Nifty from current levels, it will be a good accumulation time for strong fundamental stocks. Even now, the time is ripe for long term investments into companies with strong balance sheets, growing earnings, high dividend yields and low debt. On 29 dec 2015 above article seems perfect prediction... Still PE is above 20. Market has to correct in near time by.